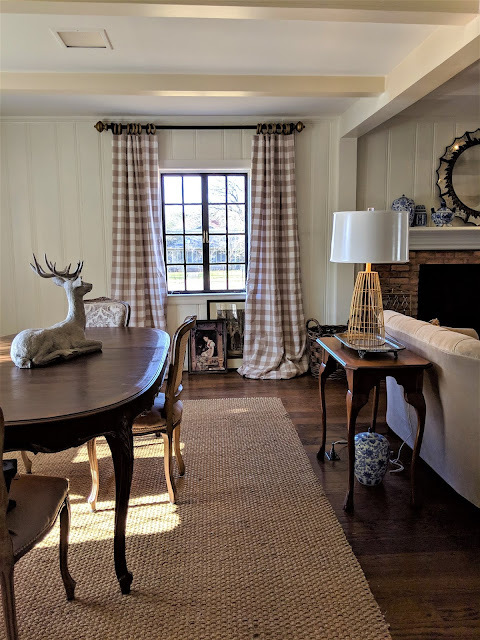 Jr. has his own ideas about design; English antiques make his heart sing, paired with industrial edge pieces, and art that shows life in the 1930's. He has a hat collection; a combination of antique and new, of which he wears all. 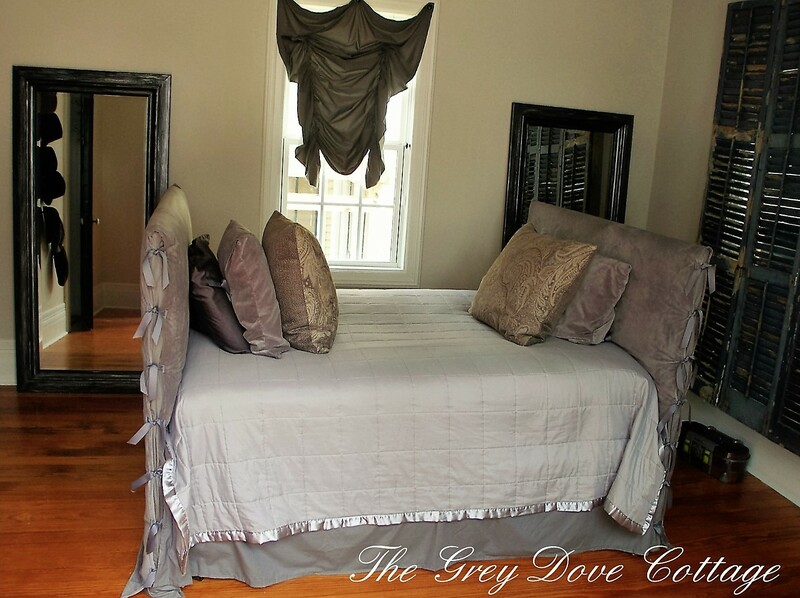 His quarters are located upon the second floor of the carriage house; a bedroom, and private bath. The bedroom space is nice sized, 14' X 16', unfortunately, with several design challenges. 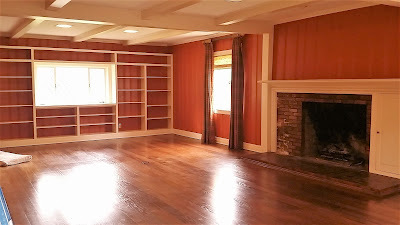 Four doors; exterior, bathroom, cottage, and closet to one of the only closets in the house. 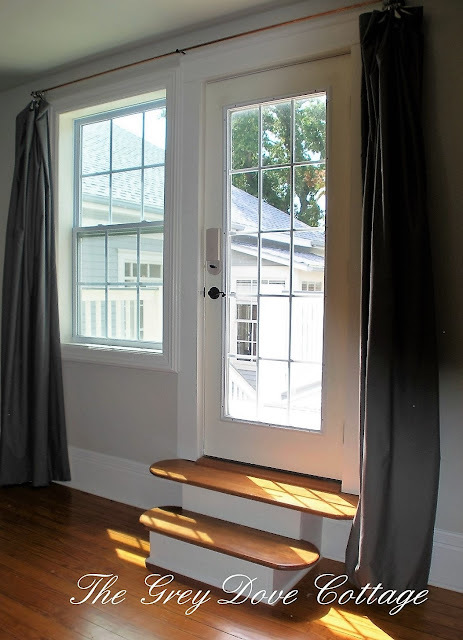 The exterior door has two steps, transitioning to an exterior balcony. There are also three windows; one with the window unit, one flanking the exterior door and one directly across from the exterior door. Between doors and windows there is little wall space and multiple pathways. There is a lot going on in this room, isn't there? Exterior door with steps to the left, center door leads to bath, and door right is the closet. 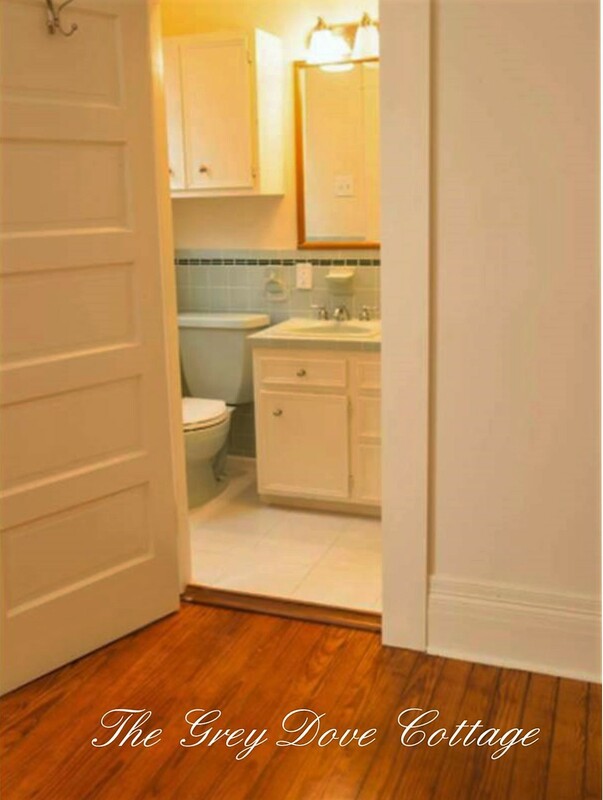 The bathroom design is difficult to date. There was a major renovation to the cottage in the past; this bathroom helps us date it approximately 1940's. The celadon green 4" X 4" tiles, matching fixtures, and darker hunter green border provide clues. The tile floor was recently covered over with white ceramic 12" X 12" tile. Someday, we plan to remove the tile and see what lies beneath. My ever hopeful self, just knows there celadon green mosaic under there - maybe. Most 1940's bathrooms, would have featured a sink set atop chrome legs. This bathroom has a cabinet, which is somewhat unusual. However, the bathroom being located atop the carriage house, would indicate it was rental property. Short-term room rental is common upon the island. Other clues to age include the door style; five rectangular panels grace each door, and also indicate the space was renovated in the 1940's. 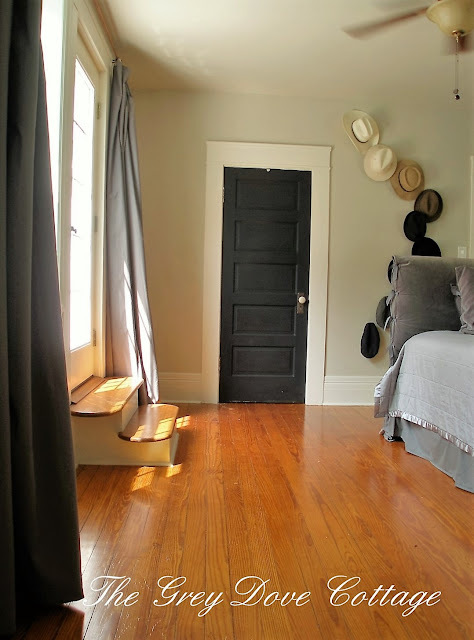 This is the only room in the cottage with the rectangular designed doors. Galveston Island was home to Fort Crockett, named after Texas hero Davy Crockett. During WWII, a portion of the facility became a prisoner of war camp. The island was "home" to a large number of military personnel. During the war it was common place for rooms to be rented to military spouses, or personnel not required to be on premises at Crockett. 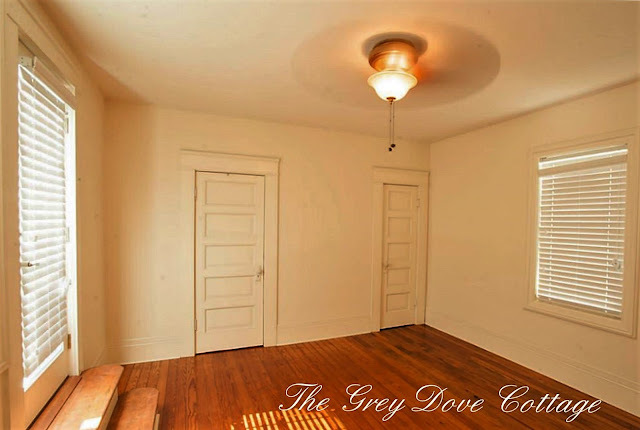 A 1940's renovation of the carriage house, creating a short-term rental space, makes sense. After the war, the fort was turned in to a recreational facility for military. Unfortunately, the facility was lost after Ike; extensive flooding, and damage resulted in the fort being demolished this past year. It was a sad loss. Jr.'s had a list of desires for his bedroom; he wanted his bed to "float" in the center of the room, allowing him to walk about the entire bed, drapes that could be easily pulled closed, something covering most of the window along the center back wall of his room, a full length mirror, his hat collection displayed for easy access and he wanted his room in all grey with no pattern. 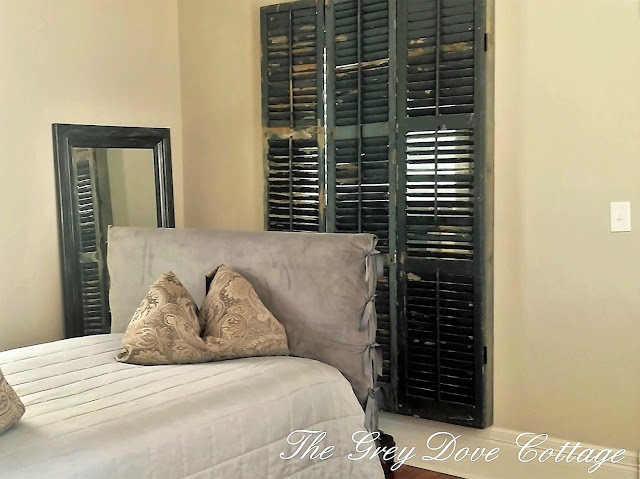 You've seen our solution to the AC hvac window unit. If not you may read about it here. We chose to make Jr. a new headboard and footboard; we used plywood, and batting, then affixed grey sheeting, and finally, slip covered each end in grey velvet tying the edges with grosgrain ribbon. There's that French touch, shhh, don't tell Jr. 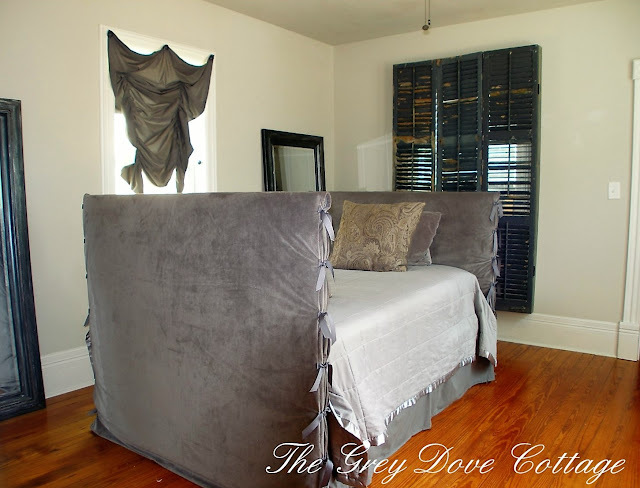 The result, a soft,padded head, and foot board giving a daybed feel. The solution for the back window; a pull shade, pulled only 1/3 of the way up, it drapes and obscures most of the view to the back window. On the island, homes are within close proximity to one another. The back window gives view to the neighbor's home, and backyard. The need for a full length mirror prompted me to use a pair of mirrors, previously located in our Austin home's dining room. The pair reflect light, and balance the wall behind the bed. Jr. didn't want the mirrors hung, he wanted them leaned, so that he can easily see himself head to feet. The back wall in this room, is calling to me. 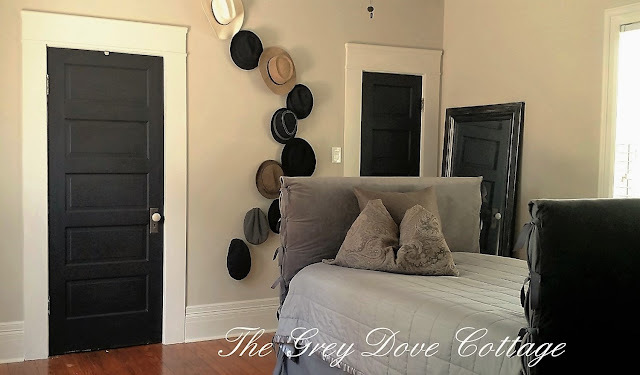 In keeping with the remainder of our cottage; the walls are painted SW7036, Accessible Beige, the trim is SW7035, Aesthetic White, and the doors are black chalk paint. I used chalk paint because I wanted the doors to have a very flat, dull finish. 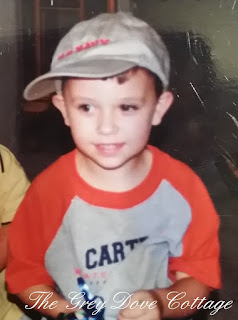 I suppose this simple baseball style cap, sparked the collecting and wearing. We spent many moments frantically searching for that hat, it had to be found in order to leave the house. "Mama pweese, not without me hat!" Melt. 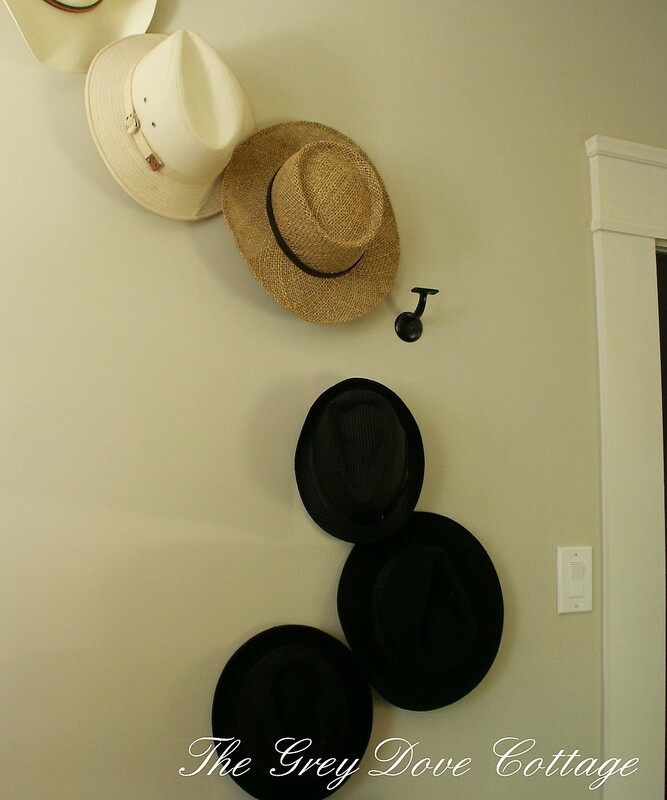 Jr.'s collection ranges from fedora's, to beret. 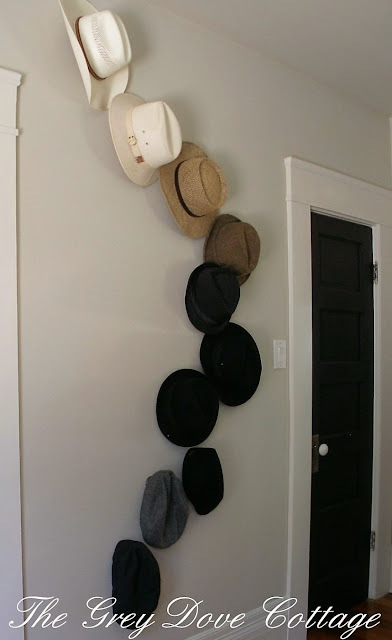 Hanging the hats so they may be easily accessed, and also maintain their shape was a trick. We chose stair railing wall brackets. The brackets are easily mounted to the wall, and have a hook with a 4" flat bar to mount a stair railing upon. That flat cross bar, holds a hat, perfectly. These mounts may be found in your local home improvement center, hardware section. The exterior entrance is flanked with one window and leads to a balcony. The height for the exterior balcony is higher than the floor of the bedroom, two steps were used to handle the transition. Jr. requested drapes that were easy to open and close. 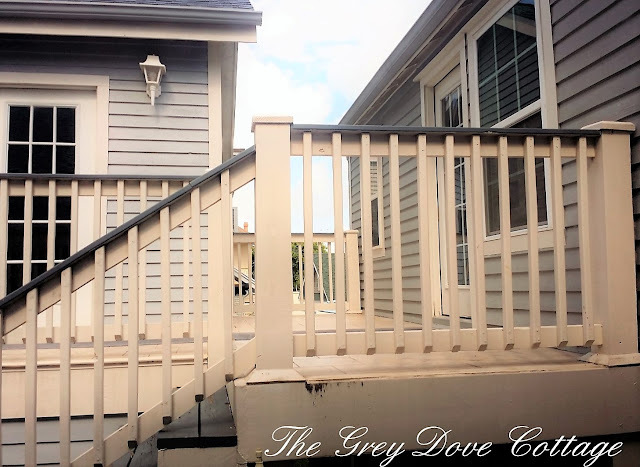 We decided upon floor length drapes; when closed they "pool" upon the steps, if we had cut them to brush the top of the steps they would have looked odd, and too short when open. I made the drapes to just "kiss" the floor. 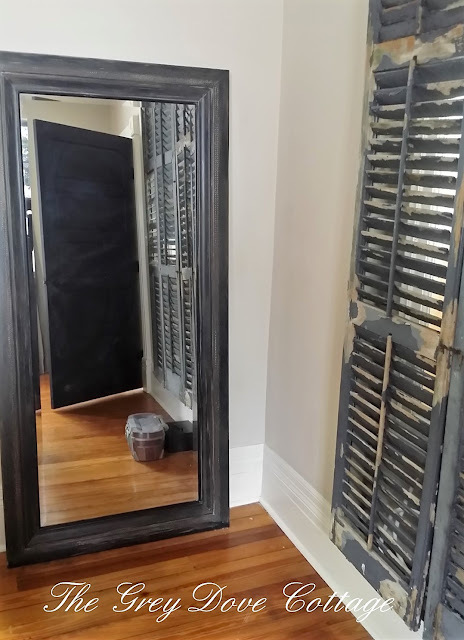 The door window combination is 8' wide. 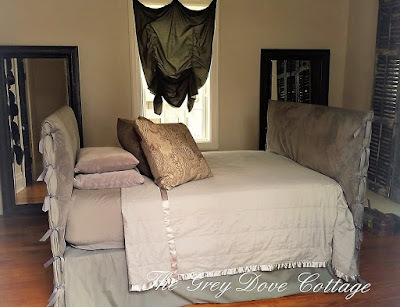 In an effort to match the bedding, and have enough fullness to the drapes, which should be twice the width of the window, we chose to use Queen sized flat sheets, lined with drapery lining. The top wall space above the windows and door is only 5" tall. The narrow space created quite a drapery hardware dilemma. We chose a 1/2 copper grounding rod, mounted on 1/2 black metal drapery rod mounts. 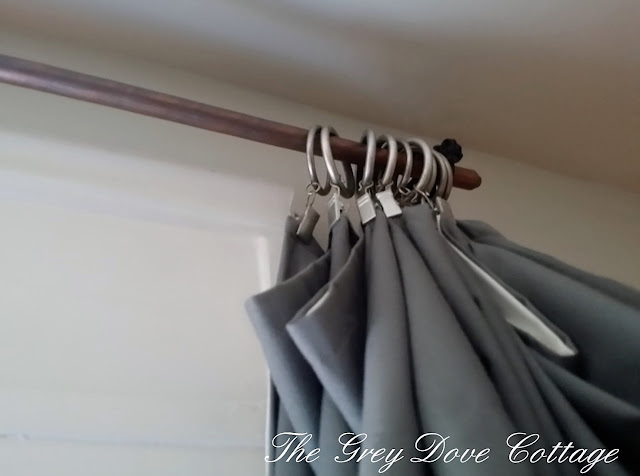 We used 1" satin nickel drapery clip rings to attach the drapery to the rod. The copper rod is normally used to ground electrical current, and may be found in the electrical department of your local home improvement center. The combination of the copper rod, black mounts, and nickel clip rings adds a little industrial flare to the space. Jr.'s version of his bed. (please forgive photo quality) What is it with guys and pillows? Jr. and I are currently negotiating his living space above the garage. It's a large open room accented with balcony. His list of design wishes are similar; grey, no print, etc.., the most interesting idea is constructing a desk from copper electrical pipe. That should be fun! I'll keep you posted. I love his hats going down the wall. It looks like a fun room for him to be a "big boy" in!